With just a few weeks left in Barack Obama’s presidency, Americans’ early judgments of his place in history are more positive than negative. Obama is poised to leave office on a high note: Current assessments of both the president and the first lady are among the most favorable since they arrived in the White House. At the same time, many express skepticism about whether Obama has been able to make progress on the major problems facing the nation, and whether his accomplishments will outweigh his failures. Democrats and Republicans have distinctly different views on Obama’s legacy, and these partisan divides are greater today than they have been for other recent presidents. And when asked in an open-ended question what Obama will be most remembered for, more cite the Affordable Care Act – which faces an uncertain future in the Republican-controlled Congress – than anything else. The latest national survey by Pew Research Center, conducted Nov. 30-Dec. 5 among 1,502 adults, finds that 45% expect Obama to be remembered as an above average or outstanding president, while 26% expect he will be viewed as average, and about as many (27%) say he’ll be seen as a below average or poor president. Obama fares well when compared with past presidents. 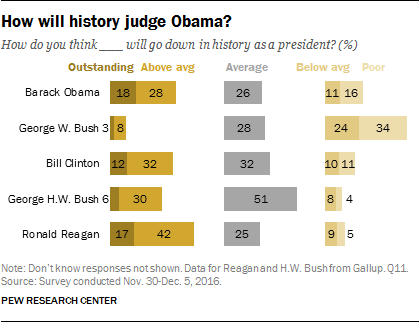 Expectations for Obama’s historical record are far more positive than those of George W. Bush at the end of his term (when 57% predicted that he would be remembered as a below average or poor president), and are roughly on par with views of Bill Clinton when he left office. And while more expect Obama to be seen as below average than said this of George H.W. Bush in 1993, more also expect him to be viewed as above average. Among recent presidents, only Ronald Reagan was predicted to fare better in the eyes of history, with a clear majority (59%) saying they thought Reagan would be remembered as above average or outstanding. 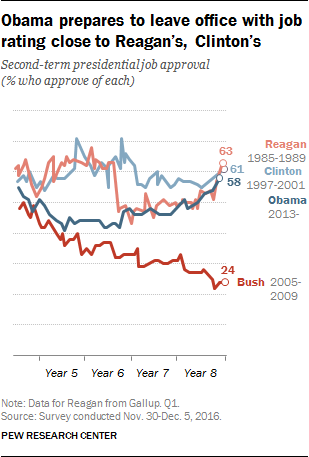 Obama is set to leave the White House with a job approval rating only slightly below Reagan’s and Clinton’s. Currently, 58% approve of his job performance, while 37% disapprove. Obama’s job ratings have steadily improved over the last several months, and are the highest they have been since a short-lived bump in approval immediately following his re-election. However, views of Obama’s job performance – as well as opinions of his historical legacy – are deeply divided along partisan lines. Nearly nine-in-ten Democrats (88%) approve of Obama job’s performance, compared with just 15% of Republicans. 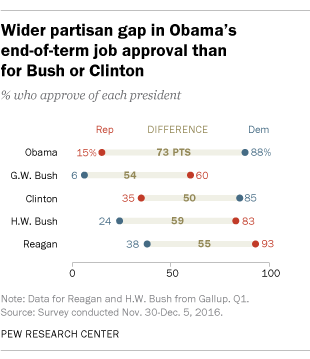 That is a wider partisan gap than in George W. Bush’s job approval rating eight years ago (60% of Republicans approved, just 6% of Democrats) or Clinton’s in January 2001 (85% of Democrats approved, as did 35% of Republicans). Obama’s average job rating over the course of his presidency is more politically polarized than any president dating to Dwight Eisenhower. Though Obama’s presidency is viewed positively in general terms, the public is divided over whether his administration’s accomplishments will outweigh its failures: Just 49% say they will, while about as many (44%) expect that the failures will outweigh the accomplishments. 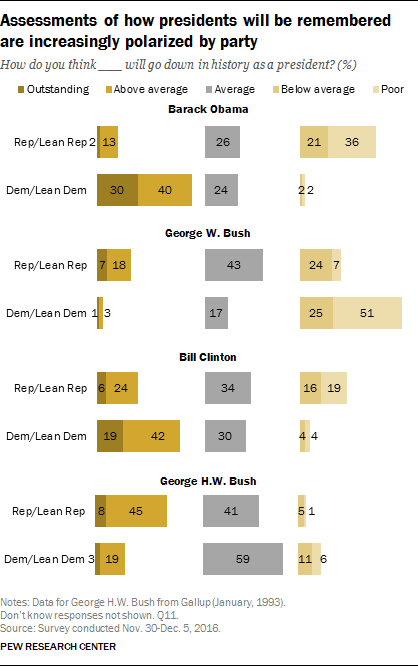 Views of Obama’s accomplishments in office fall between those of George W. Bush and Clinton. By more than two-to-one, the public thought Bush’s failures would outweigh his accomplishments (64% vs. 24%), while the inverse was true for Clinton (27% vs. 60%). 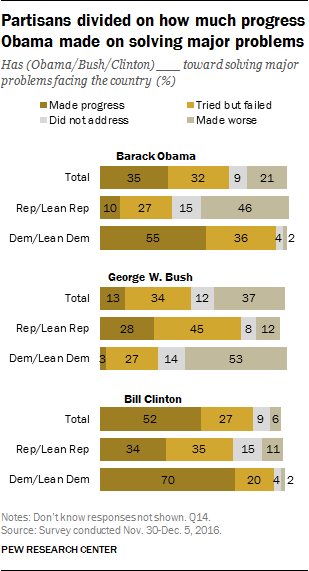 There is a far wider partisan gap in these views than for either Clinton or Bush. Today, fully 78% of Democrats and Democratic-leaning independents expect the Obama administration’s accomplishments to outweigh its failures in the long run – nearly identical to the share of Democrats who said this of Clinton in early 2001. But just 13% of Republicans now expect Obama’s accomplishments to outweigh his failures; 45% Republicans said this about Clinton nearly 16 years ago. In assessing Obama’s problem-solving efforts, 35% say he has made progress toward solving major problems facing the country, while nearly as many (32%) he has tried but failed to solve these problems; 9% say he has not addressed these problems, while 21% say he has made them worse. Again, these evaluations are far more positive than views of Bush’s record of solving problems – but far less positive than ratings of Clinton’s. Just 13% of Americans said Bush made progress in dealing with national problems (22 percentage points lower than Obama’s rating today), while about half (52%) said Clinton made progress (17 points higher than Obama). In the public’s view, Obama will be remembered more for the Affordable Care Act than other aspects of his presidency — including his election as the nation’s first black president. When asked what Obama will be most remembered for, 35% volunteer the 2010 health care law (or mention health care more generally) while 17% say it will be Obama’s election as the first black president. Notably, mentions of Obama’s domestic policies, including health care and the economy, account for nearly half (49%) of all responses. By comparison, only 9% point to foreign policy, including just 2% who specifically mention the killing of Osama bin Laden and just 1% who cite U.S. military action against ISIS. While Obama’s personal favorability ratings are even higher than his job approval – 64% have a favorable impression of the president – the public has an even more positive opinion of Michelle Obama: 72% view the first lady favorably, while just 22% view her unfavorably. Still, she remains far less positively viewed among Republicans and Republican leaners (44% favorable) than Democrats and Democratic leaners (93% favorable). In particular, conservative Republicans are more likely to have an unfavorable view of the first lady than a favorable one (52% vs. 33%). 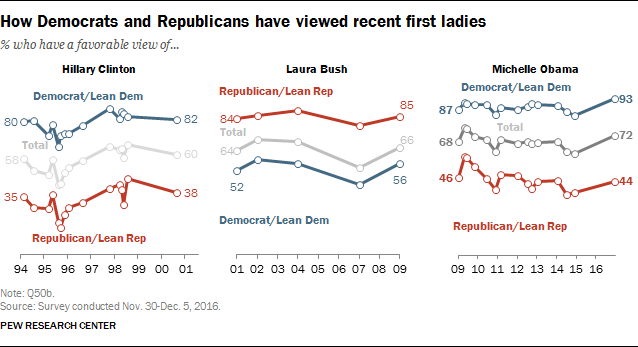 While first ladies are generally viewed more positively by those of the same party, Republican views of Michelle Obama are far less favorable than Democratic views of Laura Bush were eight years ago (when 56% of Democrats and Democratic leaners had a favorable view of her). There is a substantial partisan gap in views of how Obama will go down in history. Fully 71% of Democrats and Democratic leaners say he will be remembered as an outstanding (30%) or above average (40%) president, while just 4% predict history will consider him below average or poor (24% expect him to be viewed as average). By contrast, nearly six-in-ten (57%) Republicans and Republican leaners say he will be remembered as below average (21%) or poor (36%), while just 15% say he’ll go down in history as outstanding or above average (26% say he’ll be considered average). Expectations for George W. Bush’s legacy were more negative overall, but the partisan divide was somewhat less pronounced. For example, 77% of Democrats thought he would be remembered as below average or poor, compared with 30% of Republicans. And while the public’s overall predictions about Bill Clinton in January 2001 are roughly on par with Obama’s today, Republicans then were more likely to say Clinton would be outstanding or average (29%) than to say this of Obama today (15%), while Democrats were slightly less likely to say this about Clinton then (60%) than they are to say this about Obama now (71%). Views of Obama’s place in history also are split along racial lines. Blacks are twice as likely as whites to say history will judge Obama as above average or outstanding: Fully 76% of blacks and just 38% of whites say this. This 38-percentage point racial gap in assessments of Obama is larger than it was for other recent presidents. Though blacks were more likely than whites to say Clinton would be remembered as outstanding or above average, the gap was just 19 percentage points (61% vs. 42%). And in 2008, 56% of whites and 67% of blacks said Bush would be remembered as below average or poor. While the balance of opinion among black and white Democrats is similar as to whether history will judge Obama as above average or outstanding (79% and 71%, respectively), black Democrats are more likely than white Democrats to say he will go down as an outstanding president (46 vs. 27%). Did Obama make progress solving the country’s major problems? The public is divided on how much progress has been made toward solving the major problems facing the country over the course of Obama’s presidency. Roughly a third (35%) say Obama has made progress toward solving major problems, while a similar share (32%) says he tried but failed. About two-in-ten (21%) believe he has made things worse; just 9% say he has not addressed the major problems facing the country. Public perceptions of Obama’s success addressing the country’s major problems are more positive than views of Bush in 2008, but more negative than assessments of Clinton in his last weeks in office. Only 13% said Bush made progress on solving major problems, while almost four-in-ten (37%) said his efforts made things worse. Clinton was seen by a greater share (52%) as having made progress solving the country’s major problems. Among Democrats and leaners, 55% say Obama has made progress on solving major national issues and 36% say he tried but failed to do so. In early 2001, a greater share of Democrats said Clinton’s efforts had been successful: 70% said he had made progress solving problems, while 20% said he had tried but failed to do so. Just one-in-ten Republicans today say Obama made progress solving the country’s problems, while another 27% say he tried but failed. Nearly half of Republicans (46%) say Obama made these problems worse, while 15% believe he did not address major national problems. Republican evaluations of Clinton’s efforts were more positive at the close of his presidency: 34% said he had made progress on major issues, while about as many said he had tried but failed (35%). Only 11% of Republicans said Clinton had made things worse. Assessments of Obama’s efforts to solve major problems also divide along racial, age and educational lines. Blacks (60%) are much more likely than whites (31%) or Hispanics (38%) to say Obama has made progress on the problems facing the nation. Though roughly even shares of whites and Hispanics say Obama has made progress on these issues, Hispanics are much more likely than whites to say Obama tried, but failed to make progress (45% vs. 29%), while whites are more likely than Hispanics to say he made these problems worse (26% vs. 8%). Younger adults and those with more education take a more positive view of Obama’s efforts to solve major problems than do older adults and those with less education. There also are some differences in opinion by ideology. Among Republicans, moderates and liberals are less likely than conservatives to say he made major problems worse (31% vs. 55%, respectively) and more likely to say he tried but failed. Still, few Republicans, regardless of ideology, say he made progress on addressing problems in the country today. While few Democrats say he has not addressed major issues or made them worse, liberals are more likely than moderates and conservatives to say he made progress on these issues. As Obama nears the end of his presidency, his overall approval rating has steadily risen over the last year. Today, 58% say they approve of how he’s handling his job, while 37% disapprove. More now approve of Obama’s job performance than at any point since shortly after he was re-elected in 2012. In January, Obama’s job rating was divided: 46% approved of his job performance, while 48% disapproved. Today, the share approving surpasses the share disapproving by 12 percentage points. Though both Democratic and Republican views of Obama are little changed in recent months, the share of independents who approve of Obama’s job performance is far higher than it was earlier in the year. Today, nearly nine-in-ten Democrats (88%) say they approve of the job Obama is doing as president, while just 15% of Republicans say the same. 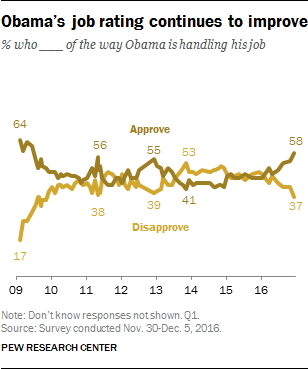 A 58% majority of independents say they approve of the way Obama is handling his job, up six points from October and 16 points from a year ago. Among Republican-leaning independents, 31% now approve of Obama’s job performance, up from just 19% in late October. And while wide majorities of Democratic leaners have expressed approval of Obama throughout his presidency, that share has grown to 84% today, up from 80% in October and just 67% in April. This is among the highest share of Democratic leaners who have approved of Obama over the course of his presidency. Evaluations of Obama among Republicans and Democrats reflect a growing partisan divide in approval ratings of the president. 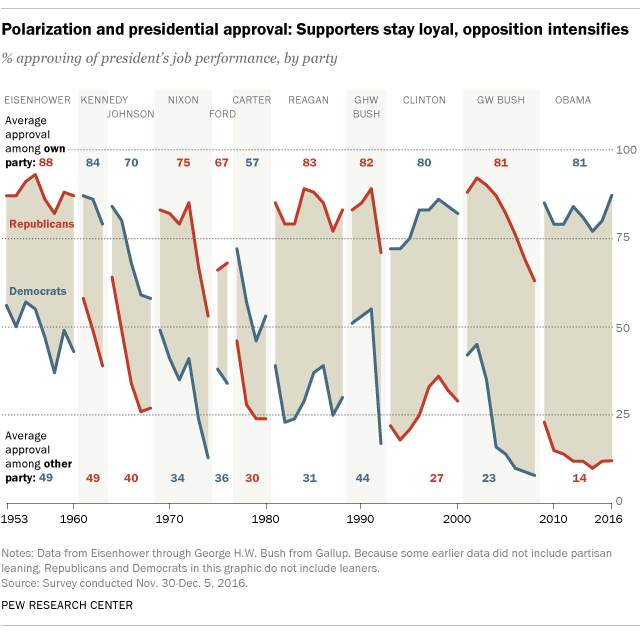 Now at its widest since the 1950s, the partisan gap in approval is driven by increasingly negative views of the president among the opposition party. Nearing the end of his two terms, Obama’s average approval stands at 14% among Republicans, compared with 81% among Democrats. Average ratings of George W. Bush were only slightly less polarized: While 81% of Republicans approved of Bush on average throughout his presidency, just 23% of Democrats expressed a favorable opinion. By contrast, the partisan divide in approval ratings of prior presidents was less pronounced. The generation gap in views of Obama’s performance as president is now wider today than it has been at any point over the course of his two terms. 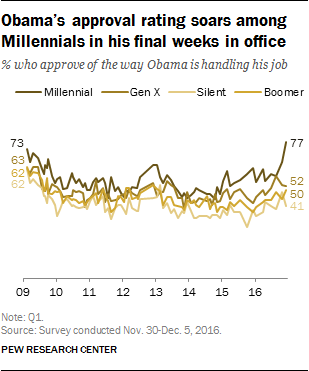 About three-quarters of Millennials (77%) now approve of Obama’s job performance, up from 66% in October and 58% in August. By contrast, 53% of Generation Xers, 49% of Baby Boomers and just 41% of those in the Silent Generation approve of his job performance – and these ratings are little changed in recent months. Millennials’ approval ratings of Obama are now higher than they have been since his first few months in office. Throughout Obama’s two terms, an overwhelming majority of blacks have expressed approval of his job performance: Today, 90% say they approve, while just 6% say they disapprove. Obama’s approval ratings among Hispanics have shifted over his eight-year term. With just a few weeks left in office, 71% now approve of his job performance. This is slightly lower than it was in early 2013, but represents a significant improvement in his ratings from late 2013 and throughout 2014, when only about half of Hispanics approved of his job performance. Whites have consistently expressed lower approval of Obama than blacks and Hispanics, but the share saying they approve also increased this year. About half (49%) of whites now say they approve of Obama, up from just 35% last December. While most white Democrats approve of the job Obama is doing as president (89% of white Democrats and Democratic leaners), a majority of white Republicans say they disapprove (79%). Obama’s personal favorability continues to be somewhat higher than his job approval rating, but has followed a similar overall trajectory: Obama is now viewed more favorably than at any point since his first year in office. Today, 64% say they have a favorable view of Obama, including 34% who say they have a very favorable view. In October last year, only about half (49%) had a favorable view of Obama, including only about two-in-ten (22%) who viewed him very favorably. Though the president’s favorability ratings have improved over the last year, Michelle Obama remains more popular than her husband: Nearly three-quarters of the public (72%) also have a very (46%) or mostly (25%) favorable opinion of the first lady, compared with 22% who view her unfavorably. Views of Michelle Obama have changed only modestly over the course of eight years, though the share who see her favorably is up 11 points from last year. While ratings of Michelle Obama are positive across all gender, race, age and educational groups, she is viewed more favorably among younger Americans, women, non-whites and those with higher levels of education. Nearly eight-in-ten adults under 50 (78%) view Michelle Obama favorably, compared with a somewhat narrower majority (64%) of those 50 and older. There also is a modest gender gap: While roughly three-quarters of women (76%) give Michelle Obama a positive rating, a slightly smaller majority of men (67%) say the same. And while roughly nine-in-ten blacks (91%) and 84% of Hispanics have a favorable impression of the first lady, whites (64%) are less likely to say this. Similarly, 80% of those with a college degree or more education give her a positive rating, compared with 68% of those who have some college experience of less education. 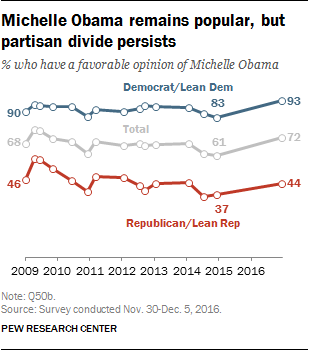 The partisan gap in views of Michelle Obama is stark. Wide majorities of Democrats and Democratic-leaning independents rate Michelle Obama favorably (93%), including comparable shares of liberal Democrats (95%) and conservative and moderate Democrats (92%). By contrast, Republicans and Republican leaners are divided in their opinions: 44% of Republicans think of her favorably, while 46% have an unfavorable opinion. Views of the first lady are particularly negative among conservative Republicans: Just 35% view her favorably, while 52% say they have an unfavorable opinion of Michelle Obama – including 19% who view her very unfavorably. Among moderate and liberal Republicans more view Michelle Obama favorably than unfavorably (59% vs. 35%). Views of Michelle Obama are far more polarized across the course of her eight years as first lady than were views of Laura Bush when George W. Bush was in office. By the end of Bush’s term, a 56% majority of Democrats and Democratic-leaning independents rated Laura Bush positively, as did 85% of Republicans and leaners. The partisan gap in views of Michelle Obama is on par with that of Hillary Clinton throughout her time as first lady. In January 2001, a few weeks before Bill Clinton left office (and just after Hillary Clinton was sworn in as a Democratic senator), 82% of Democrats and 38% of Republicans viewed her favorably.